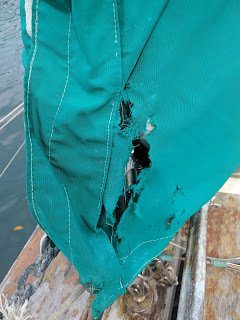 On a boat, there is always something to do, so every morning, I know that I will have to repair something around the boat for a couple of hours to keep her ship shape. This morning it was sewing the fender covers. They cost $70 and to order some new ones from a long way away, would be a hassle so it is easier just to sew them up. And while I have my needle and thread out, I noticed that my staysail sail cover also needed repairs. Meanwhile, my neighbor was also doing boat chores. 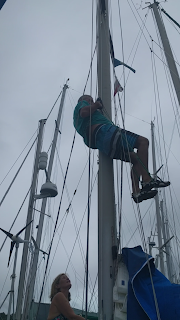 He was attempting to climb the mast to fix his flag halyard. Very painful to watch. 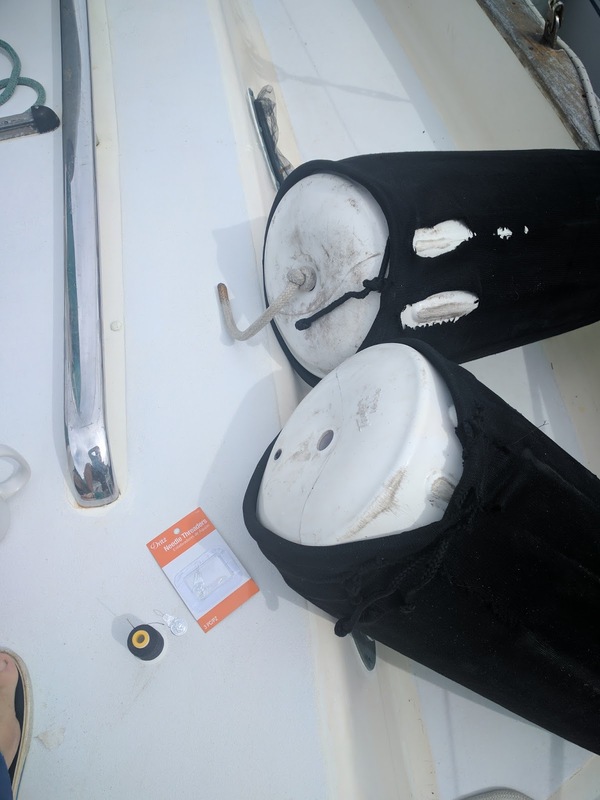 I guess we all start out with methods on the boat that we gradually improve upon. The hardest part for me, was to just sit, knowing full well that there was a much easier and safer way to do it. I have long learned about judging others though because context is everything. Sometimes too, there is just no way around it. You have to learn by your mistakes. With boating, it's not always about how much you know because technology especially these days, is constantly changing. It's all about the learning process and making the right decision. For example, when presented with multiple options, being in a marina next to a boat yard as opposed to the middle of nowhere makes all the difference. They say walk a mile in another man's shoes.